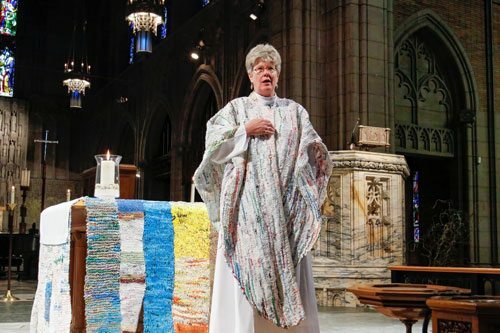 In the Knitting Pearls, members and friends of Trinity Cathedral who like knitting and similar crafts live out the words of St. Paul through our shared hobby. As we meet in small groups, we come to know one another more intimately and share in one another’s lives. In a safe and friendly environment, beginners and experts alike support one another with creativity, advice, and empathy. As we present our work to those in the congregation and beyond who are in need of celebration or condolence, we grow those bonds and knit others to ourselves. The completed and given work can even take on a role of its own in starting conversations about faith and church (“Where did you get that blanket?”), extending the connections still further. So the pattern grows. Beyond the work of knitting infant blankets for baptisms, scarves and mittens for elementary school children and the many other projects that the Trinity Cathedral Knitting Pearls undertake each year, the group of knitters, crocheters, needle pointers and coffee and tea drinkers weave together a strong community. “It was the first thing I joined, and it’s absolutely been a lifeline for me,” says Beth Billings, Friday morning group leader. “There are days when I think I don’t want to do a lot of things, but I would never give up on Knitting Pearls. We rely on each other and are in community with each other.” Read the entire article. The Knitting Pearls is a group of knitters (and crocheters and needle pointers and coffee/tea drinkers) meeting weekly for fellowship, prayer, and knitting. At any meeting, you could expect to find a friendly and open group, usually between three to eight people. All are welcome, and members are especially encouraged to bring friends. Meetings are lay-led and may include a reading or prayer. Some members work from home and do not attend the weekly groups. We make blankets for infant baptisms, prayer shawls for those suffering illness or grief, and hats and scarves for children at Trinity’s neighboring K-8 Marion-Sterling School, in addition to a number of other items. 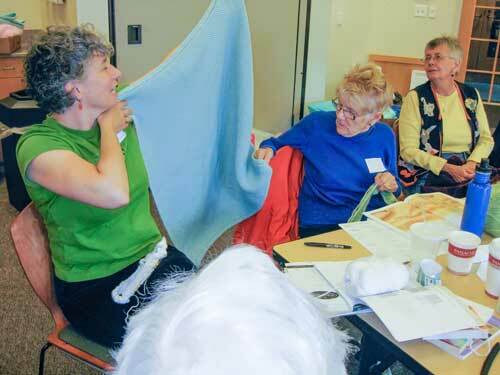 At any meeting, members bring any project to work on including their own, and receive assistance, advice and encouragement from each other, (not always about knitting!). The yarn is obtained from our group “stash,” but needles or hooks are not available. 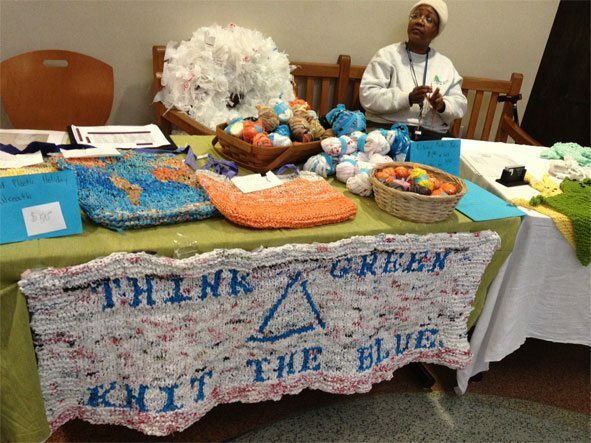 In 2011, the Knitting Pearls created liturgical hangings and vestments out of used plastic shopping bags in honor of Earth Day and had made yarn to sell from recycled plastic bags to raise money to fund several ongoing microloans for women entrepreneurs in developing countries. 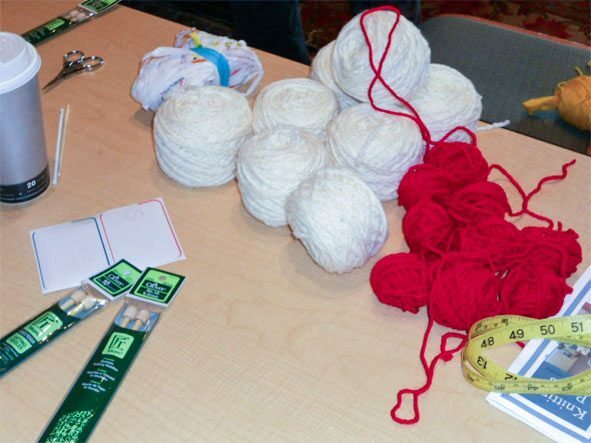 In 2012 we began offering classes to help newcomers learn or improve their knitting skills. 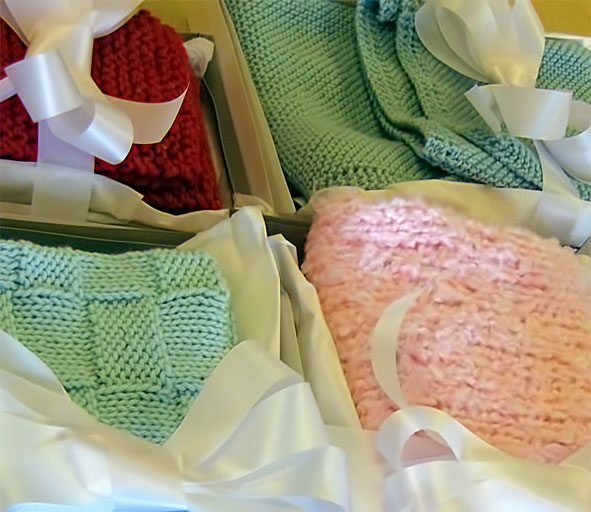 There is no set level of contribution from our members, but our need for knitted or crocheted items is continuous: all infants, children, and adults baptized at the Cathedral receive a knitted gift from the Knitting Pearls. Lay ministers bring prayer shawls to the shut-ins along with communion, and every year the Pearls team up with the Caregivers Group from Trinity Cathedral to provide the Marion-Sterling schoolchildren with warm winter hats, scarves, and gloves. We are always collecting prayer shawls in any color; blankets (gender neutral colors, cream or white if possible); plus children’s sizes of scarves, mittens, and hats. If you are interested in making lap robes, infant gifts or scarves, our clergy can always use those items in home visits or adult baptisms. We keep a store of them. Your contributions will be most welcome. (Keep in mind your unfinished projects when considering what to make). Anyone can make a contribution. Have you received partially knitted or crocheted projects, yarn, needles or hooks you have no use for? All donations of finished items or materials can be left at the reception desk at Trinity labeled for the Knitting Pearls. Meets 6-8 p.m. weekly between September and May, and monthly June-August. Led by Toni (Antoinette) Ponzo. Meets in Cafe Ah-Roma inside Trinity Commons building. During the summer, the Monday Knitting Pearls group will meet at Rascal House Pizzeria (1836 Euclid Ave) on June 12, July 10 and August 14. Open to all. Contact Toni at amp1of5@gmail.com for more information. Meets 9-11 a.m., weekly from September–May (except the Fridays after Thanksgiving, Christmas and, Good Friday). Summer sessions will be held on June 9 & 23, July 7 & 21 and August 4 & 18 at 9 a.m. Led by Beth Billings. The Friday Group meets in the Board Room. Contact Beth at billings13@gmail.com to learn more. Knitting Pearls continues partnering with the Parents and Caregivers Group of Trinity Cathedral to provide warm winter hats, scarves, mittens, and gloves, to the Marion-Sterling Elementary School for their students and families. The items are presented yearly at Christmas time but are gathered by our group throughout the year. Our goal is no cold kids, so please consider joining in and donating handmade, store-bought or like-new items this year through our Annual Scarf Drive, or bring them to us anytime. The Marion-Sterling school colors are blue and gold, and team colors from the Browns, Cavaliers and Indians are also popular. Click here for knitting instructions. We welcome the newly baptized and offer comfort to the ill or grieving with the work of our hands with blankets, prayer shawls, and other items. The Cathedral’s clergy are able to bring gifts provided by the Knitting Pearls on their calls. Click here for knitting instructions. We will certainly accept and use pink or blue blankets, but have more flexibility with white, cream or gender-neutral colors. Size should be at least 40-inches square. Other newborn items like booties, hats or jackets are fun to make and may be taken by our clergy as a gift when visiting the family of a newborn. Triangular and rectangular shapes are common. Any attractive color combination or stitch pattern is acceptable. A comfortable length is often close to that of the person’s arm span, which turns out to be roughly their height. A width of 21 inches or more is usual. Any color combination or stitch pattern is acceptable for a lap robe. These are the most popular item for boys or men, so keep masculine themes in mind when planning this as a project. Sports team colors can be especially popular. A lap robe should measure at least 40 by 60 inches. Knitting Pearls hosts a day-long Knit-In event open to all each year on a Saturday close to Halloween. We begin with morning prayer in the chapel of the Cathedral, and then spend the rest of the time in fellowship together working on our projects. The event marks the in-gathering for the Marion-Sterling Scarf Drive, and at the end of the afternoon we bless the items we have gathered. Parking is free, children are welcome and participants are encouraged to bring friends, food and drinks. 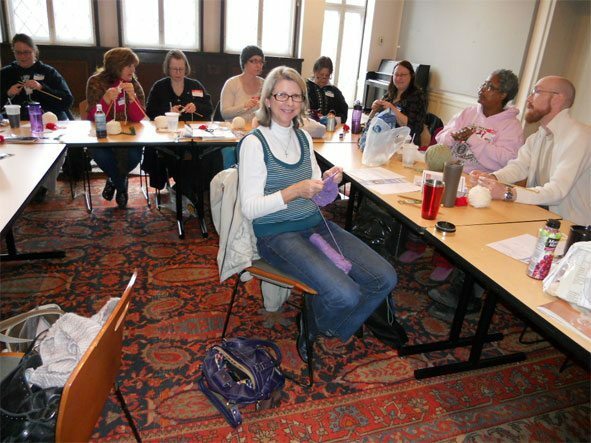 In early 2012, Knitting Pearls offered a Learn to Knit Class from 10-2 p.m. on a wintry Saturday afternoon. Members of the Knitting Pearls welcomed newcomers and gave one-on-one instruction in basic knitting techniques. Needles and yarn were provided for a suggested donation of $10 which was applied to the Knitting Pearls microloan, and our participants made great progress over the course of the event. We plan to offer it again, at least once a year with a minimal materials cost. Beginning in April 2012, Beth Billings taught a sweater knitting class for beginning and intermediate knitters on six Saturday afternoons from 12:30-2:30 p.m. Response has been very positive, and we plan to schedule additional Saturday classes. Participants were able to purchase materials on their own or could order through Beth and pay a $50 materials cost. Step 1: With fingers stretched out, bend your wrist back with the other hand, hold for 15 seconds then return to neutral, repeat on the other side. Step 2: Stretch your arms and hands forward with wrists straight, like a zombie, and hold for 15 seconds. Step 3: Make a tight fist with one hand and hold for 15 seconds. Then release fingers one at a time starting with pinkie first and working in order back to the thumb. Repeat on the other hand. Consider gently stretching your neck from side to side and back and forward while counting to 15, and holding your legs straight and off the floor with toes pointed up for one of the counts. No matter how often we ask. With strength for whatever the task. In a glorious and wonderful way!